Hello and thank you for offering such help. 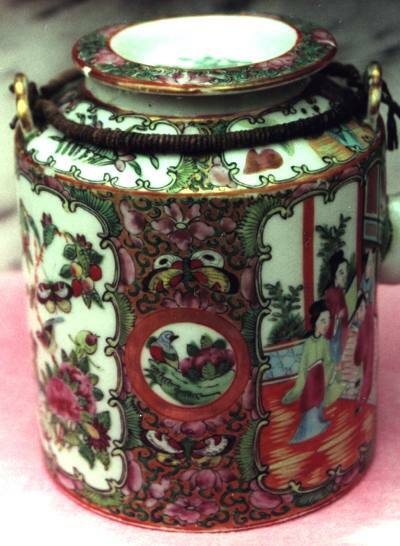 I am sending an attached pic of a Chinese Jar about 200 years old. There is no marks that I can see in it. I am asking if you could help me by giving a kind of value about it thank you again. Late 19th/early 20th century "Rose Medallion"
Your jar is actually a teapot and with a North Ameriacan export decoration called Rose Medallion. This decoration was begun with in the 1820s and are still continued. From the shape of the pot and the general quality of the decoration I would guess a date for your pot ir more likely to be from the first decades of the 20th century. I can't see really, but the enamels tend to be thinner and brighter the more modern they are and these do not seem to have the soft apperance the older enamles have, so I am afraid I have to leave it at that I really don't know.